Great new Kit Kat ad. 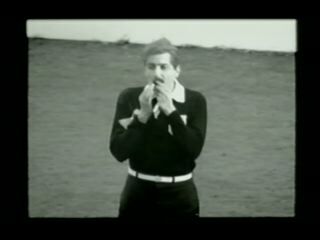 Footage from the 1966 World Cup Final is shown, with Geoff Hurst's infamous 3rd goal which strikes the crossbar, and as England celebrate, Germany are contesting the goal, so the referee goes to the Russian linesman and instead of following the action he is eating a Kit Kat and hasn't seen the controversy. Flustered, he gives England the goal. Then the tagline comes up: "Have a break, have a Kit Kat." The idea is great, and the execution is brilliant. What more could you want? Here's the ad, courtesy of fellow Brit ad blogger FishNChimps. Congrats to creative team Colin Jones & Michael Campbell, and director Chris Palmer.